One of the trends that characterized the consumer electronics niche in 2013 was the emergence and growth of wearable. Early indications are that this trend is going to continue throughout 2014 and beyond. If you are a sucker for fitness gadgets, then the sneak peek of the LifeTrak Brite R450 at the ongoing Consumer Electronics Show in Las Vegas will come as exciting news for you. The Smart R415 now it calls Brite R450 is the latest iteration in LifeTraks revered fitness watch series. With the growing awareness of the importance of maintaining fitness and good health, this piece of gizmo couldn’t have arrived at a better time. This watch is far from just a fitness tracker though; it performs admirably in the smartwatch’ category, connecting with your smartphone and notifying you of events such as incoming calls, messages and emails. So what are the most exciting features of the Lifetrak Brite R450? 1. Smartphone notifications and Bluetooth connectivity- this watch notifies you when you have a text message, missed a call, incoming call or email on your smartphone through a vibrating alert. You can get 8 types of notification, emails, IM, calls, SMS, reminders, news, general alerts, and high priority alerts. To enjoy this service you will need to download a third party application that enables it to communicate with the smartphone. It can connect to your Bluetooth Smart ready devices and with the Open API platform one can access new and existing Android 4.3 and iOS 7 (or newer) applications to integrate with LifeTrak technology. 2. SleepTrak -Automatic sleep tracking and intelligent wake up: by monitoring micro movements, vitals as well as auto-detecting the start and end of the sleep session, this watch can determine the quality and duration of sleep without the user having to press a single button. It is also able to determine when you have had enough rest and wake you up gently using a vibration alert. 3. LightTrak – It measures your levels of exposure to light constantly and tracks melanopsin-sensitive blue wavelength, and it lets you know when you’re not getting enough or too much blue light at appropriate times of the day, so you can take steps to improve your mood and energy levels, this will improve for a better night’s rest. 4. ECG-accurate heart rate monitor- this displays your heart rate accurately at the press of a button and doesn’t require a chest strap, unlike conventional fitness trackers. 5. Step counter- this device is equipped with a pedometer that counts your step and is able to automatically differentiate between running and walking as well as non-stop activities. 6. Waterproof- it is submersible up to 90 feet, allowing you to keep an eye on your activity when you are swimming, equating each stroke in the water to 5 steps so as to compensate for the more demanding nature of activity inside the pool. 7. Calorie counter- using a special algorithm that takes into account the heart rate and activity level, the Brite R450 can automatically monitor the calories you burn all day long. 8.Active Graphic Display with 7 days fitness records- it allows up to seven-day records enabling you to keep track of your progress. The data can also be synced to various applications such as Argus and MapMyFitness among others. It is equipped with an easy to use display and a 3-button navigation system. Daily measured parameters reset automatically at midnight allowing you to set daily independent workout goals. 9. Time functionality- of course, it wouldn’t be called a watch without being able to perform the basic function of a watch; that of telling time. It is capable of displaying time in AM/PM and 24-hr systems as well as the day and date. It also has a settable alarm and stopwatch applications. 10. Some additional qualities- this watch is ergonomically sound; it is very light and comfortable and comes with a band that is reversible to switch colors. You won’t have to replace the battery cell for up to one year and it doesn’t have to be recharged. The fitness technology industry continues to grow in leaps and bounds and countless fitness gadgets continue to be introduced into the market. Only the best products get to enjoy success and longevity. 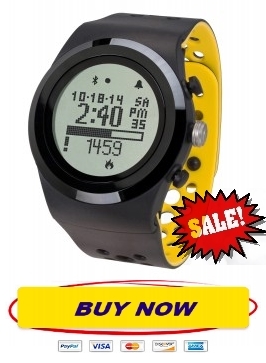 The LifeTrak Brite R450 is right up there with the very finest fitness watches in the market. The only major downside to this device is that you have to press a button to activate the ECG, rather than the watch continuously tracking the user’s heart rate. That said, however, it is still going to be a formidable device if the sneak peeks at the CES on Jan 7 is anything to go by. LifeTrak has a long and reputable history of producing fitness gadgets, one more reason to believe that the R450 won’t be a letdown and will be well worth the price tag.